With all your favorite wines pre-chilled to the perfect temperature in the Koolatron 24 Bottle Wine Cellar, you're sure to be a big hit with all your guests. A combination of elegant design with state-of-the-art thermoelectric cooling technology, it features unique tempered mirror glass doors and soft interior lighting for a cool look. 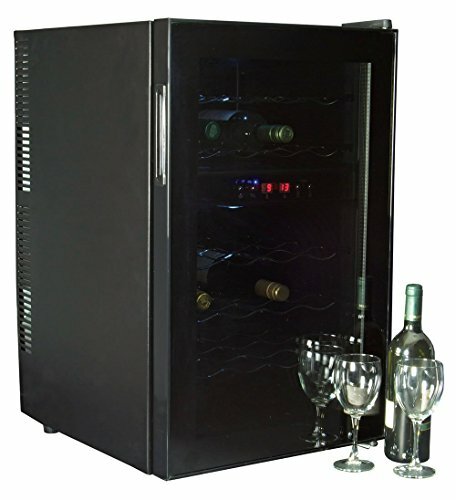 The removable stainless steel wine racks accommodate up to 24 regular sized 750ml wine bottles. The touch screen LED display allows you to digitally adjust the temperature, so that all your vintages are stored at the perfect temperature right down to the degree. For best results, set up your wine cellar in the coolest area of the room, away from heat producing appliances, and out of direct sunlight. Dual-zone cellar with separate cooling chambers. Holds up to 24 bottles (750ml). Digitally adjustable temperature, select either C or F. Vibration free, free-standing with adjustable leveling feet. Tempered mirror glass doors, soft interior light. Removable stainless steel wine racks. Dimensions: 18L x 18W x 29.50H in..
View More In Wine Cellars. If you have any questions about this product by Koolatron, contact us by completing and submitting the form below. If you are looking for a specif part number, please include it with your message.